Bengaluru: Southern Air Command Air Officer Commanding-in-Chief Air Marshal RKS Bhadauria on Tuesday flew the multi-role fighter jet Light Combat Aircraft (LCA) Tejas. 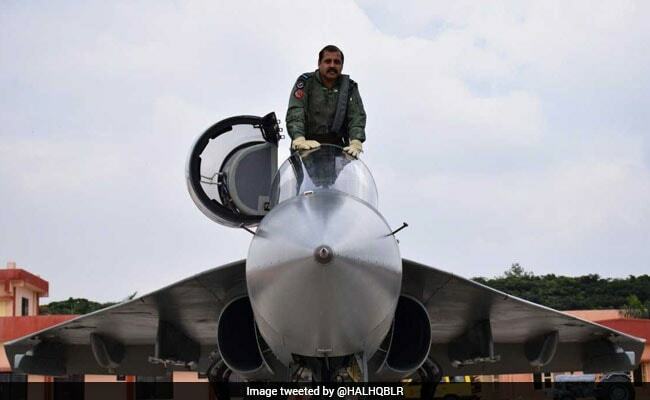 "Air Marshal Bhadauria flew Tejas for 30 minutes solo from the HAL airport in the city's eastern suburb and reposed faith in the advanced combat aircraft," said its maker state-run Hindustan Aeronautics Ltd in a statement. The single-seat and single-engine fighter is the world's smallest and lightest supersonic aircraft, designed and developed by the state-run Aeronautical Development Agency (ADA) and built by HAL. "The Squadron hosted Air Marshal Bhadauria, who has been associated with the Tejas programme for long," the statement said. The Squadron, which will be stationed at Sulur near Coimbatore in neighbouring Tamil Nadu after getting the FOC next year, is currently training air and ground crew from its initial operational base at the HAL airport in the city. The defence behemoth has an order to deliver 40 Tejas to the IAF by 2020 in two batches, with 20 fighters in the Initial Operational Configuration (IOC) and another 20 in Final Operational Configuration (FOC). "We have two production lines for the LCA to meet the operational requirement of the IAF and are ramping up the capacity to roll out 16 Tejas per annum from 8 currently," said HAL Chairman and Managing Director T Suvarna Raju on the occasion. The Tejas Squadron has also undertaken detachments at operational bases to test the weapon capability of the agile aircraft. "With the additional assembly line, we will ramp-up the production rate of the LCA to meet the delivery schedules of the IAF," added the statement. The Defence Acquisition Council had given initial clearance in November 2016 for an additional 83 Tejas in the Mark-1A configuration specified by the IAF.